A Citrus, Summer Ale blitzed with a whopping 10kg of lime zest and juice, pink grapefruits, a sprinkle of salt and a whole lotta sultry. An American style pale ale infused with beans from Darkstar coffee. 100% brettanomyces fermented wild ale. 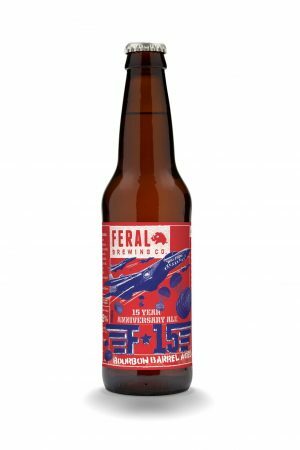 Introducing the limited edition, bourbon barrel aged, Feral Brewing anniversary ale. Recent times has seen the traditional hop growing regions of Germany endeavouring to breed flamboyant and expressive aroma and flavour hops to rival the varieties offered by the new world US, New Zealand and Australian growers. Our exclusive collab with The Queens Hotel- inspired by the iconic $5 shakes in Pulp Fiction. Proud & Bold this full bodied, pigment-blotter of a beer is not afraid to reveal its bitter & fiery temper. A standout character on the field. The Runt is a good introductory to the range on offer. Our flagship IPA that has a primary fermentation in new French oak barriques before being returned to stainless steel for final processing and carbonation. When we managed to get our hands on some Sorachi Ace hops we certainly saw the sign and were inspired to pull this golden oldie out from our back catalogue. First Brewed in May 2013 for the Great Australasian Beer Spectapular in conjunction with Melbourne Good Beer Week. Canadia is known for many things, apologies, polite driving etiquette, Rob Ford (RIP) and fashion innovation. So good it makes even walruses cry. About as New Zealand as Russell Crowe, this Kiwi brew has risen to fame out of our Swan Valley brewpub. Our 10 year Anniversary Celebration beer. A collaboration between Mane Liquor, Whipper Snapper Distillery and Feral Brewing.